Overseas holidays are always memorable for children – and being able to show your kids the wider world is a rewarding part of parenting too. But travelling as a family as different – a lot different. Remember those holidays you took before you had children? Remember how you relaxed your days away, footloose and carefree? Remember the wild nights, the sleep-ins, the lazing on the beach and the take-it-as-it comes approach to globetrotting? One area where many travellers get caught out is having a passport that’s close to its expiry date. When travelling abroad, ensure your passport is valid for at least 6 months after your planned arrival date home. This will avoid unpleasant surprises – like not being allowed to board your plane! Passports are crucial documents, so make a copy of relevant pages and email them to yourself along with copies of birth certificates and other proof-of-identity documents. Everyone has their own idea about how flexible they want to be with booking holiday accommodation. You might want to know in advance exactly where you’re staying every night you’re away. Or, you might prefer to keep options more open. Either way, it makes sense to reserve at least the first four nights to get your bearings and make a dent in everyone’s jet lag. Depending on the destination and time of year you travel, leaving accommodation to chance can be dangerous. If it’s high season and everything is booked out, you can find yourself with no place to stay. If you’re staying somewhere for a good stretch, consider renting an apartment – it can turn out cheaper than paying for hotels, especially since you can cook your own meals. Above all, try not to shift locations continuously – children appreciate being able to stay in one place for a few days. Having to pack up every morning is more stressful for them (and you!). Overseas ATMs can be temperamental things and a card that works in one might not work in another. That’s why you should take multiple cards to maximise your opportunities. Don’t forget to advise your bank of your itinerary before you travel. If you forget, they may view any overseas transactions as an attempt at fraud and immediately freeze your account. The more children you have and stuff you need to bring, the more bags you’ll have. Get in the habit of doing a bag count every time you leave a hotel, hop in a taxi or arrive at a new destination. It’s surprisingly easy for a kid’s knapsack, laptop case or small carry-on to get left behind if you don’t. If you’re carrying a money belt or neck pouch under your clothing, always do a quick pat-down check to make sure they’re in place before changing locations. It’s not a pleasant scenario, but it can happen: you arrive at your destination tired but excited after a long flight, grab your carry-ons, head to the baggage carousel – and your suitcases don’t show up. They might be permanently lost or just delayed for a day, but either way, if you’ve thought ahead and packed a few essential items (like a change of clothes for everyone) in your carry-ons, you’ll be better off. Medications should always be in your carry-on luggage. Children love the excitement of flying to a new country but appreciate the familiarity of their own favourite possessions and activities too. They’ll fall asleep better if their favourite toy or blanket is at hand. Neck pillows, loose clothing, good hydration and removal of shoes can all help your family get through a long flight. The camera you used to photograph toucans in Costa Rica or cheetahs in Botswana is overkill for a family holiday. Leave your bulky camera behind and just take your smartphone and/or a thin, pocket-sized digital camera instead. If you’re travelling with a laptop, you can upload your photos every other night onto a free online storage site. Otherwise, just carry spare memory cards for the camera. Just about every family has a conversation like this at least once during an overseas holiday: “Where did you put my phone charger?” “I don’t know – I thought you packed it.” When one parent packs a bit of this and the other packs a bit of that, things get left behind. The solution is simple: leave one person in charge of packing everything. That way they know where everything lives. If you’ve done your research, you may already know about health risks at your destination (undrinkable tap water, crazy traffic, mosquito-borne diseases or whatever). But your travel doctor can advise you on things you may not be aware of and make sure you have all the vaccinations and medications you need for a safe, healthy journey. The doctor can also provide a signed authorisation list of medications you’re taking with you, to make customs enquiries go more smoothly. 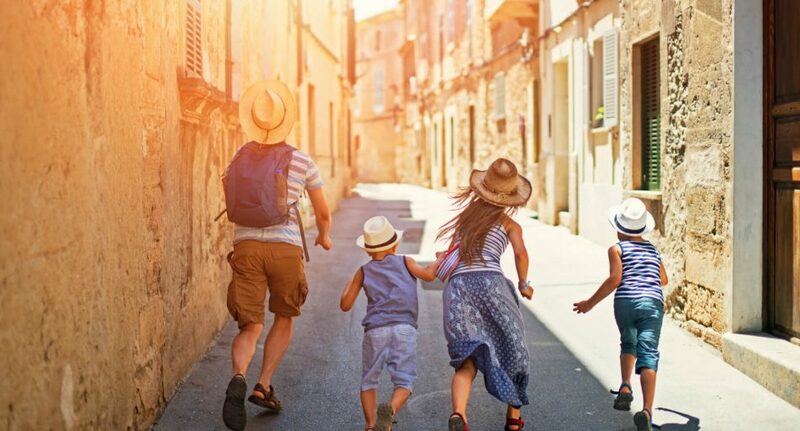 One thing you don’t want to leave home without is a family travel insurance policy. You needn’t buy this from your travel agent – it’s easy enough to shop around online for the most suitable deal. You’ll rest easier knowing you’re covered for unpleasant surprises like serious illness or injury, lost luggage, stolen belongings, emergency medical evacuation, sudden cancellations and more. Travel insurance is not all the same, so make sure you understand what’s covered and what’s not for your trip. What you decide to pack for your big family adventure depends on how long you’re away, the country’s climate, age of your kids and all sorts of other factors. One item many parents forget to pack is a plug-in nightlight (you may need an adapter for the foreign wall socket, too). This is used in the bathroom of every foreign hotel you stay at. It makes it much easier for everyone to locate the loo in the dark in an unfamiliar room, improving safety and easing stress for little ones in a new environment. Just remember to take it with you when you leave! There are innumerable online resources for traveller’s these days, whether you want to know about the best paella in Barcelona, what gear you need for a visit to the Borneo jungles or which parts of Nicaragua are safest. One place you should also check before heading abroad is the Smartraveller website. It has the most recent information on specific countries, general tips for Australian travellers and even a page all about Travelling with Children. The longer the overseas flight, the more likely you and your family will be affected by jet lag. Adjusting your body clocks to a new time zone can take a few days. If you land in the morning, one of the best anti-jet lag plans is to have showers at the hotel, change clothes and head out for a walk in the fresh air. The light exercise will do everyone a world of good and give you a chance to investigate the neighbourhood. Find a park or playground for the youngsters. Have a light dinner and get everyone to bed early in the evening. The quicker you adjust to local time, the better. Don’t plan on any major tours or strenuous activity on your first full day – ease into things slowly. Travelling is all about exploring new things – languages, food, friendships and experiences. Encourage your kids to try regional foods, play with local kids at the park and make their own suggestions about what to see or do the next day. Let kids explore their new environment with activities and facilities adapted to their age at Club Med to immerse them in the local culture. Do your children know what to do if they become lost in a big airport, shopping mall, crowded marketplace or on a hiking trail? Discuss these scenarios with your kids beforehand so they know how to respond. Designate a meeting place whenever you’re in a new spot with risk of separation. Another handy option is a child monitor – a digital device worn on the child’s wrist that corresponds to a tracking device held by the parent. These are becoming more popular all the time for use in emergency situations. The good news: some overseas hotels offer a breakfast as part of their rates. The bad news: this morning meal can vary widely from country to country and between hotels. If you’re lucky, you might get a sumptuous buffet brekky including yoghurt, juice, eggs, grilled meats, fresh local fruit and cereal choices galore. But in other establishments, breakfast might mean a single stale bread roll, a handful of jam and butter packets and a motley collection of tea bags. Thanks to the almost-instantaneous feedback on sites like TripAdvisor, it’s not hard to suss out the quality of breakfasts in a particular spot beforehand so you know what to expect. When it comes to dining abroad, the standard rule is to avoid tourist hotspots and eat where the locals eat. Over the course of an entire trip, this practice alone can potentially save you many hundreds of dollars. The building safety regulations that we all take for granted in Australia may not be apparent in other lands. As soon as you arrive at a new hotel room, there are some things to check. How low are the ceiling fans? Are windows screened and lockable? Is there any electrical wiring exposed? How scalding is the water in the hot water taps? Are there any wobbly fixtures that present a danger to children? What are the door locks and balcony railings like? If you’re travelling in tropical countries where flying insects (especially mosquitoes) are an issue, you may need to bring your own mozzie netting for sleeping if these aren’t supplied. And remember that Aussie kids aren’t used to brushing their teeth with bottled water, so give them the drill about unsafe tap water if needed. Know where the fire escapes are and if your children are at the hotel pool, gym or sauna, you should be there supervising them.